Five sterling silver gold rings connected by a 14k gold heart represent your family’s eternal bond. Your family might be scattered across town or the world, but it's love that keeps you banded together. This sweet design represents your unbreakable bond. Canela Lemoine handcrafts the sterling silver rings, connecting them with a single 14-karat gold heart. It's a thoughtful gift for a new mom, your own mom, or anyone else who has your heart. Handmade in California. Please check out our Personalized All Heart Necklace and Personalized All Heart Bangle Set from Canela Lemoine. Ring When Stacked: 1/4" Pendant: 1/4"
The ring looked great in the ad but I was disappointed and I did return it. 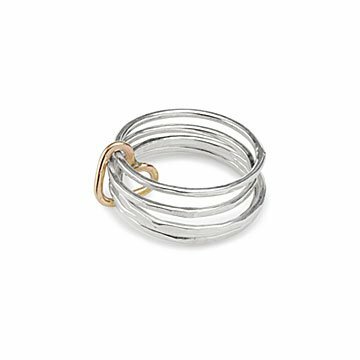 This unique ring is comfortable and fun to wear. I would recommend this ring. Rings are comfortable and stylish.